Pro-2nd Amendment students hold nationwide school walkout? Carlsbad High School in Carlsbad, New Mexico. Will Riley, the 18 year old senior who organized it said about 600 students walked out for the final 16 minutes of the school day in order to minimize the classroom disruption and ensure that freshmen taking standardized tests could participate. He posted: "My hometown, Carlsbad, had a great turnout and I’m proud to say the same about the country overall. The “Big Three” broadcast networks (ABC, CBS, and NBC) and Spanish-language networks Univision and Telemundo ignored Thursday’s student-led Stand for the Second nationwide school walkout against gun control. This blackout came after the networks collectively spent 10 minutes through numerous reports favorably reporting on the nationwide March for Our Lives walkout led by anti-gun Parkland students back in April. Stand for the Second came in response to the March for Our Lives student walkouts for gun control sparked by the Feb. 14 mass shooting at Stoneman Douglas in Parkland, Florida, which left 17 dead. The National School Walkout events on March 14 and April 20 drew massive media coverage as tens of thousands of students walked out, in some cases marching off campus and attending rallies at state capitals and the U.S. Capitol. More than 2,000 schools signed up for each of those walkouts. While he noted the “modest” size of the walkout, the CBS reporter never mentioned that the anti-gun walkout had tremendous help in promoting their cause through the media’s vigorous support. MSNBC even urged viewers to sign a promise to vote anti-gun. And in the run-up to the pro-gun walkout, they didn’t give that group of students a single second of promotion. Since February 15 (the day after the Parkland, Florida school shooting) through March 19, the Big Three (ABC, CBS, and NBC) morning and evening news programs have aired 69 stories, plus an additional nine interviews, talking about the students’ anti-gun efforts. During that same time, these networks failed to run even a single story mentioning any of the students from the same high school who have openly championed the Second Amendment. In all, the networks aided anti-gun advocates at a rate of 11 to one in terms of who they went to for opinions and analysis. That’s not to mention the number of liberal activist groups and celebrities who came together to give them a boost. In spite of the media’s underreporting, the Stand for the Second walkout took place in high schools across the country: those who want to preserve their right to bear arms stood up to make their voices heard. 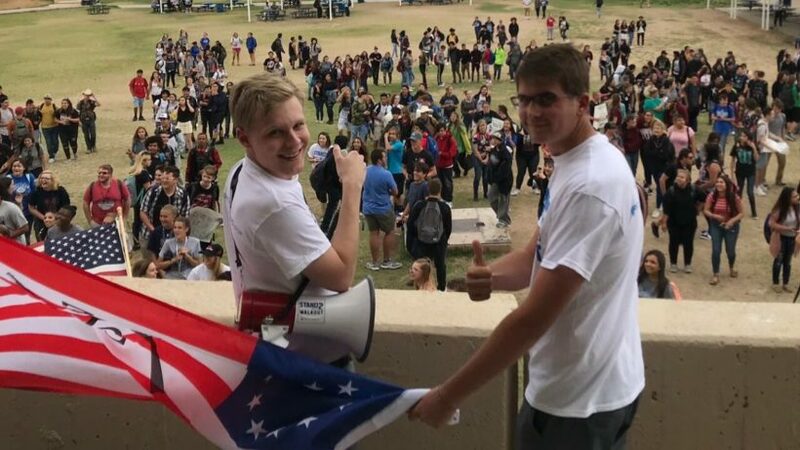 Will Riley, the 18-year-old New Mexico senior who organized Stand for the Second, said more than 500 schools had registered to participate. At Carlsbad High School in Carlsbad, New Mexico, he said about 600 students walked out for the final 16 minutes of the school day in order to minimize the classroom disruption and ensure that freshmen taking standardized tests could participate. “Ours was one of the bigger ones, but we had multiple reports of schools having several hundred students participating, and that’s just what people are sharing with us,” Mr. Riley said. At the other end were kids who said they were the only ones at their schools to participate. Most of the television coverage came from local stations, with mentions on CNN and ABC, while the reporting on Fox News was more extensive. Mr. Riley said one of his motivations for Stand for the Second was to ensure that schools gave equal treatment to both sides [as not all teens stand on the same side of every issue], adding that he felt his walkout received more pushback than the gun control protests. Excerpted from posts at the Washington Times and MRC. 1. What type of bias do the “Big Three” and Univision and Telemundo display in not reporting on this grassroots student-led walkout? 2. Why do you think the media chose to generally ignore this story? 3. Visit the Stand for the Second Twitter page. Had it received widespread favorable press the way the March for Our Lives walkouts / rallies did, do you think more students would have attended (would more students have joined with the Stand for the Second groups at their schools had they known about it?) Explain your answer. 1. The media displayed bias by story selection and omission.